President Frank-Walter Steinmeier the last piece of German hard coal. WUPPERTAL, Germany—During December, the long tradition of hard coal mining ended with an emotional final act at the Prosper-Haniel mine in Bottrop, Germany. With tears in their eyes and singing the song Glück Auf, based on the traditional German miner’s greeting, miners brought the last piece of coal to daylight from a depth of about 1,000 m on Friday, December 21, 2018. “We are here, on Prosper-Haniel, to witness a moment of history, documenting the end of German hard coal mining,” said Frank-Walter Steinmeier, president of the Federal Republik of Germany. 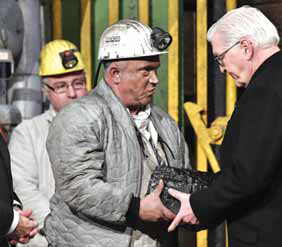 Below the now idle Prosper-Haniel headframe, Mine Foreman Juergen Jakubeit passed the 15-lb chunk of coal to President Steinmeier, who explained that this is a day of mourning for miners. “With this farewell to coal, an important and essential part of German history comes to an end,” Steinmeier said. Coal contributed substantially Germany’s history. A true strategic mineral, it powered the wars of the early 20th century and, after defeat, it helped re-establish the country as an economic powerhouse. Germany decided to end underground hard coal mining in 2007. At that time about 33,000 miners and other staff were working in the mines. Today there are still 3,000. Generous early retirement arrangements ensured that there were no layoffs. In addition, from 1996 to the present, Germany invested EUR61 billion ($68 million) with contributions from its federal budget and the state of North Rhine-Westphalia to subsidize coal sales, while closing mines. The decline of the Germany’s domestic mining industry will also have an impact on the country’s mining equipment manufacturers. Early in the cycle, however, they began to export their skills and technology. So much so that, today, the domestic market now plays much less of a role in their business plans, with a total turnover expected to decline by 22% to EUR 90 million ($101 million) in 2018. According to Dr. Michael Schulte Strathaus, chairman of mining for the German Engineering Federation (VDMA), the country’s current policies demonstrate little affinity to the business of extracting raw materials, and therefore mining, and are highly unlikely to provide any impetus for domestic business. Germany’s mining equipment industry is therefore becoming increasingly dependent on foreign business. While Germany’s last hard coal mine has been shut down, Poland is currently expanding the country’s hard coal mining activities in an effort to reduce its dependence on imports. Hardly any impetus is also expected from the potash and salt industry, as Schulte Strathaus emphasized during the association’s annual press conference. The sector expects a further decline from its domestic mining market in the future.